Private live dealer tables are a relatively new phenomenon at live online casinos. Mostly they are still provided by Evolution Gaming, who have several studios across the world – including Malta, Canada and Latvia. Other companies, such as PlayTech and NetEnt, are entering the market though. The advantages of these customised tables are many. For a start, casinos can use their own branding. This gives the tables a unique feel and look, compared the standard Evolution designs. The big draw though, is being able to offer unique interactive promotions – such as special promo cards that can be drawn in blackjack games for example. They also give casinos total control over betting limits and custom game rules to create unique twists on classic tables. But which online casino uses this burgeoning technology do its fullest? Who provides the best integrated offers available? 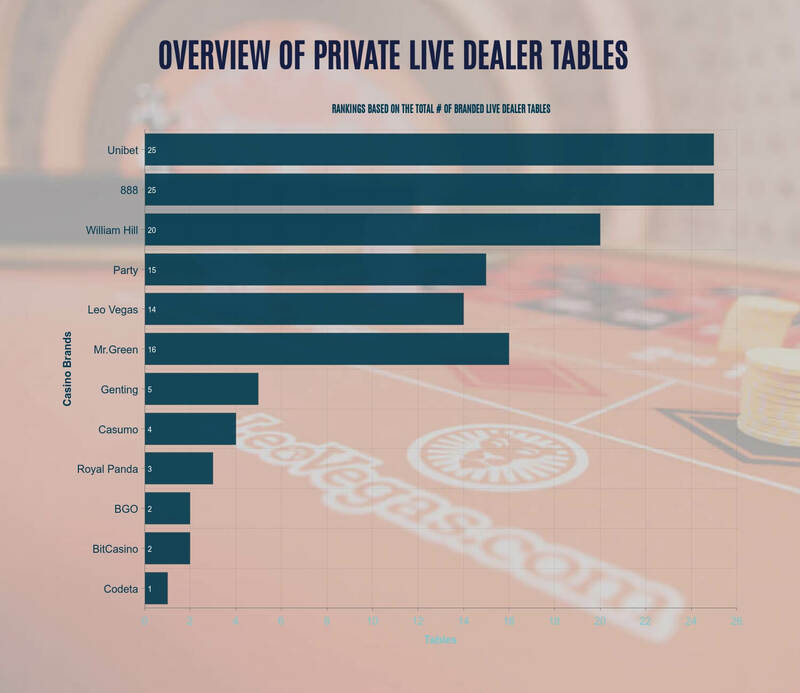 Our expert team delved into the top live dealer casinos that offer dedicated custom tables, to find the answer to these questions and more. Leo Vegas is the big boy of live casinos with over 100 titles, by three separate developers: Evolution Gaming, NetEnt and Extreme Live Gaming. However, only Evolution provide the private Leo Vegas tables – 14 of them in total. This collection covers three roulette tables and 11 blackjack rooms. At Leo these tables separated into their own category, called Chambre Séparée, so they are easy to find all at once. All these tables come in Leo Vegas’ custom colour scheme of pink and cream, giving a warm and classy vibe to proceedings. These live tables are hosted in the same Evolution live studio, so you can see the action going on at the other tables as you play. Bets range from £0.50 a spin on Leo Roulette Show, up to £5000 a spin on the same table. Leo VIP silent blackjack also has a max bet of £5000. The Leo Silent Blackjack table is an interesting concept, in which the dealer stays (as the name suggests) completely silent during gameplay. This allows players to focus on strategy without interruption, creating a totally unique live casino experience. 888 casino is a well known online casino, and one of the oldest operators in the game. They officially launched in 1999. Not many providers can claim that kind of longevity. In terms of private live dealer tables, this Israeli company has jumped on the emerging technology – with a cool 25 tables encompassing blackjack, poker, roulette and its own hi-lo card game called 888 Casino Clash. All 25 tables come in 888’s futuristic neon green and black combo colour scheme, giving them a slick cyberpunk type feel – which is pretty cool. The 888 private table blackjack dealers also wear 888 football shirts too. We’re not sure if this is their usual attire, or if it is just to celebrate the FIFA World Cup that was on at the time of our review. Either way, it makes a nice change from the normal black tie and dresses. Bets start from a little as £1 on the 777 Roulette table, and go all the way up to a dizzying £20,000 a hand in the Sapphire Elite Blackjack room. When we conducted this review, 888 was running an exclusive promotion for private table live casino players. Using the format to great effect, 888 have hidden 12 bonus cards in the 8-deck shoe of their 888Xtra live blackjack tables. Draw one of these to bag yourself a nice bonus between £25 and £100. Although this bonus cash does have a 35x wagering requirement, the promotion does make good use of private table technology. William Hill is another online casino with a lot of experience in the betting world, having opened their first betting shop in 1936. And they’re still at the forefront of gambling innovation today. Although, on first visiting their site you may William Hill exclusive tables conspicuously absent. On the William Hill Casino site, only live casino games by NetEnt are provided. There might be 28 tables available, but there’s only one custom table – a blackjack one – and that’s your lot. However, should you head on over to the dedicated William Hill Live Casino site, you’ll find another 70 tables by Evolution Gaming. Out of these, a nice 19 are private live tables – bringing the total up to 20. Each destination has its own unique branding, with lots of gold and neon lighting. The William Hill PlayTech table stays true to WH’s traditional colour scheme the most, but all their custom tables have their logo present. Bets range from £3 to £10,000 on the Private Blackjack tables, to £25,000 per spin on the Mayfair VIP roulette. At the time of our review, there were no special promotions taking advantage of William Hill’s private table technology – although we have seen them do so in the past. So, keep an eye on their live casino promotions page for the latest updates. Get dealt a blackjack on their VIP or standard Royal Panda blackjack tables on the 21st of each month, and you’ll be entered into a draw to win £210. Best of all, this prize is real withdrawable cash and not bonus money with a wagering requirement. The betting limits on Royal Panda’s exclusive private tables range from £1 minimum on roulette, to £10,000 a hand on their Blackjack VIP table. These didn’t look as great as some other casinos we have reviewed here, but they were perfectly usable tables. The BGO live hosts were interesting, friendly and professional – but overall the tables lacked a little sparkle that you might find somewhere else. BGO Prime Blackjack has a £2 minimum and a £1000 maximum per hand. BGO Prime Roulette on the other hand, has a £0.5 minimum and a £100 max per spin. With 25 private tables available, Unibet is tied with 888 as the casino with most custom branded tables on this list. Unfortunately though, depending on your point of view, 23 of these are blackjack tables and only the remaining two are in roulette. However, all the tables do look and feel great to play at. The Unibet branding is excellent, with a futuristic neon green and black setup. The roulette tables even have a spinning U adorning their middle sections. You can definitely see Unibet & Evolution put the effort in to make this studio their own. Bets on both Unibet Roulette tables went from £1 to £10,000. The bet limits on Unibet’s Exclusive Blackjack tables went from £5 all the way up to a dizzying £50,000 per hand. When it comes to promotional offers, Unibet are a big fan of score tournaments. Although there were none running for their exclusive live casino titles at the time of writing this, we know they do and have run them in the past. Players compete to get the biggest win over a certain time period, usually 24 hours. All results are displayed on a leaderboard on the tournament page. Winners rewards can range from free spins to cash bonuses or physical prizes. Codeta styles itself as a ‘live casino revolution’, so we were more than a little surprised to fund just one private table here. Instead of having their own separate studio like some casinos with multiple private tables, Codeta’s private table is in the same room as the rest of its standard Evolution gaming tables. So, the backdrop doesn’t really change much – in fact the only difference we could see between Evolution’s standard blackjack tables and Codeta’s was their name on the felt. Hardly using this technology to the full! Considering they have nearly 100 other Evolution tables to choose from, you’d think they’d have invested in private tables more heavily. Codeta Blackjack has a £1 per hand minimum and a £5000 maximum. Mr Green, however, is a casino that cannot be accused of skimping on their private table selection. Not only do they have 16 Mr Green branded tables spread across roulette and blackjack – but they also host the exclusive Mr Green Beyond Live Experience. This multi-table live casino extravaganza allows players to switch between five different tables, without ever leaving the lobby. Each one is visible from the others and has a dedicated space on the floor plan, so you can see them move around realistically as you swap tables. Each time you move tables a nice little cutscene plays, featuring the Green gentlemen himself, as the camera glides around the swanky penthouse casino floor. The suited Mr Green avatar also moves around the tables offering quips and advice – and helicopters fly past outside the (virtual) windows, for a true high-rolling experience. NetEnt really comes through with the goods on this one, making it one of the most premium live casino experiences on the web. Just make sure you have a good internet connection, as it can be quite data heavy. Wagers at Mr Green exclusive tables start as low as £1 and go as high as a truly high-rolling £100,000 per spin, at the Mr Green VIP Roulette table. Casumo offers a reasonable four exclusive live casino tables – covering three blackjack tables and one roulette wheel. Considering the unique nature of this casinos branding though, we were certainly expecting more from their appearance. Apart from the Casumo name, which wasn’t even on the felt just a graphical overlay, we really couldn’t see what sets Casumo’s exclusive tables apart from the standard Evolution ones. Or at least, visually. Take a look at our screenshots below and let us know what you think! Casumo’s solitary exclusive roulette table has a £1 betting minimum and a £10,000 maximum. The three blackjack tables have a minimum of £5 and a maximum of bet of £2000 per hand. They have recently upgraded their live dealer studios and are now among the most popular live dealer brands among UK and Canadian players. Genting is a massive brand – if you live in the UK, you’ve probably seen one of their land-based casinos in real life. But how does their exclusive live casino table collection hold up? All the Genting exclusive live tables look great and play smoothly. You can tell they have made a real effort to keep the consistent style of their casino brand. Not being able to interact with the dealer in the Roulette Live streamed games is a bit disappointing, but a price worth paying for this unique experience. Especially if you’ve never been to a real casino floor. Betting limits at Genting’s exclusive tables are a bit low in comparison to many casinos on this list. The Genting live stream roulette tables start at £0.5 and go up to £100, and the Genting blackjack table goes from £5 to £500. Considering some casinos offer tens of thousands of pounds as their upper limit – this could put off some truly high-rolling players. BitCasino.io is a bitcoin exclusive casino. Allowing players to gamble using cryptocurrency is certainly a forward-thinking manoeuvre. Does their adoption of private table live casino technology live up to this precedent? Sort of – they have two, one in baccarat and one in blackjack, both provided by Evolution gaming. Both these tables looked decent and followed the minimal branding of the rest of the BitCasino site. The dealers were professional and smart, and the stream was high quality without interruption – as you’d expect from Evolution really. They were, however, quite difficult to access. During our review it took us a good five minutes to actually work out how to find and open these tables, since the Evolution lobby was quite well hidden. Bets at the BitCasino.io’s exclusive tables start at around 1000 uBTC ($0.2) and go up to 500,000 uBTC, which is around $100. Obviously the actual exchange rate fluctuate with the value of bitcoin, which is a notoriously volatile cryptocurrency – so don’t take those valuations as gospel. This UK based online casino opened in 1997 and was one of the most successful online casinos of its time. In 2016 it relaunched with new branding and an updated interface for the modern online casino world. But how quick has it been on the uptake, when it comes to exclusive live casino private tables? Not very is the answer – with only one Evolution powered exclusive table in evidence when we visited for our review. Considering the host 60-plus other tables from Evolution, this was more than a bit surprising. Their solitary exclusive table was a blackjack one. It looked quite good, with a nice and distinct purple colour scheme that fits well with the rest of the site. However, nothing else about the table was particularly special. Bets on Party Casino’s exclusive blackjack table start at £5 and go up to £10,000 per hand. However they also share 14 tables branded as Clubhouse with their sister site bWin, bumping the total count up to 15.